A room filled with clocks (the theme of time) appeared under the opening credits, with images of inventors (Thomas Edison and Ben Franklin) and other Rube-Goldberg like automated contraptions that worked improperly. This room was later identified as the quarters of madly-eccentric, wild-eyed, crackpot scientist Dr. Emmett "Doc" Brown (Christopher Lloyd). A TV news broadcaster announced that a Libyan Terrorist group took credit for the alleged theft of plutonium from the Pacific Nuclear research facility. Entering into the room was the main protagonist - skateboard-riding, guitar-playing, Hill Valley high-school student Martin "Marty" Seamus McFly (Michael J. Fox, from TV's Family Ties). Marty received a call from his friend Doc, telling him to meet him at Twin Pines Mall at 1:15 am that night to see a "major breakthrough." Marty skateboarded to school, where he met his pretty girlfriend Jennifer Parker (Claudia Wells), and was reprimanded for being repeatedly tardy by bald, disciplinarian principal Mr. Strickland (James Tolkan). After school as they were talking in the town square, a woman approached with a petition to save the town's Clock Tower that had been struck by lightning exactly 30 years earlier. Marty returned to his home in a residential development park called LYON ESTATES, where his parents were introduced: his nerdy and wimpy father George McFly (Crispin Glover), who was arguing with his bullying supervisor Biff Tannen (Thomas F. Wilson) about Biff's recent car accident that he blamed on the 'blind spot' in George's car, and Marty's boozing mother Lorraine (Lea Thompson), who was complaining about her brother (Uncle Joey) who didn't make parole again. An important detail was revealed about how Lorraine met George - Lorraine's father hit George with his car when he was in the middle of the street; feeling sorry for George, they went to the "Enchantment Under the Sea" dance where they kissed for the first time on the dance floor. At Twin Pines Mall in the early morning of October 26, 1985, frizzy-haired Doc unveiled his time machine invention to Marty (his silver DeLorean car, powered up to 1.21 gigawatts of electricity with plutonium, stolen from Libyan terrorists). After witnessing Doc's dog Einstein's short one-minute time-travel trip into the future ("temporal displacement") in the parking lot (at 88 mph), Doc was ecstatic. Marty was zapped back 30 years earlier to November 5, 1955 (before Marty was born!) - the day that "Doc" invented time travel when he hit his head (falling off his toilet while hanging a clock) and had a vision of a "flux capacitor." As Marty disappeared and ventured to the past, Doc was shot and supposedly killed when the Libyan terrorists appeared to retrieve their stolen plutonium. Arriving in a more rural Hill Valley, Marty hid the DeLorean behind the billboard advertising the development of Lyon Estates. He began a search for the "Doc" of 1955, to persuade him that he came there from the future in a time machine of his invention, and have him provide fuel for the car to return 'back to the future.' In the town's diner, he encountered his dorky future father George still being bullied and tormented by tough-guy Biff. Events that Lorraine had earlier described weren't exactly fulfilled - George was 'bird-watching' (actually he was a peeping tom) when he fell into the street from a tree limb. Marty saved him by pushing him away, but was hit by a car driven by Lorraine's father Sam Baines (George DiCenzo) - taking George's place! Marty was taken to Lorraine's house to recover, where his teenaged, 16 year-old mother-to-be first nursed him back to health and developed an amorous infatuated crush on him, and continued to make inappropriate sexual advances toward him. Those circumstances threatened to wipe out the entire future McFly family. Marty began meddling in the relationships between his teenaged parents-to-be in order to ensure his own existence by having them get together at the Saturday night 'Enchantment Under the Sea' dance and fall in love. Marty asked Lorraine to the dance initially, and as they sat in a parked car, she made sexual advances toward him after taking a swig of liquor and smoking a cigarette - and then removed her jacket and kissed him passionately. After Biff approached and forcibly removed Marty, the romantically-incompetent George summoned up his courage and decked Biff with a fist to the face to protect Lorraine from Biff's sexual assault. Marty escaped and through a series of circumstances was able to play lead guitar at the school dance (he replaced the injured lead guitarist, permitting the dance to continue), first playing "Earth Angel" as Lorraine and George kissed on the dance floor, and then shocking the audience with a rock 'n' roll rendition of "Johnny B. Goode". Back at the town square, with a jolt of 1.21 gigawatts of power provided by a lightning bolt hitting the town's clock tower at the precise moment of 10:04 pm (Saturday night, November 12th), Marty was helped by the 1955 "Doc" to return to the present in the DeLorean. "Doc" was saved from being killed by the Libyans by reading a letter that Marty wrote in 1955 ("Doc" had first ripped it up, but then scotch-taped it back together) - and protectively wore a bullet-proof vest. At the film's conclusion, everything in Marty's life regarding his family and their relationships had changed for the better - ie., he found that Biff was only an obedient auto-detailer, and his father was a successful book author. 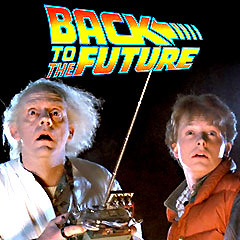 A panicked Doc suddenly returned from the future year of 2015, 30 years later, and told Marty: "Marty! You've gotta come back with me!...Back to the future! "; Marty asked: "Wait a minute, Doc. What are you talkin' about? What happens to us in the future? Do we become assholes or somethin'? ", with Doc's worried response about their future children: "No, no, no, no, no, Marty. Both you and Jennifer turn out fine. It's your kids, Marty! Something's gotta be done about your kids!" As Doc charged up the DeLorean and squealed out of the driveway, Marty noted: "Hey, Doc. We better back up. We don't have enough road to get up to 88"; Doc smugly replied with a famous line: "Roads? Where we're going, we don't need roads!" - the DeLorean unexpectedly levitated into the air, then zoomed down the street, turned, and flew directly into the camera. This witty science fiction adventure comedy/fantasy film has often been considered one of the greatest teen movies of the 1980s - notable for its special effects and for the Huey Lewis and the News soundtrack. The film was humorous due to its view of the mid-1950s world before rock n roll - and more. It was filled with 50s period props, such as the Four Aces singing "Mr. Sandman" and Davy Crockett posters, and Marty's singing of "Johnny B. Goode" to an astonished audience. With the tagline: "It's only a state of mind." Also, President Reagan quoted from the film in his 1986 State of the Union address: "Where we are going, we don't need roads." From its four Oscar nominations (including Best Original Song "The Power of Love"), it won only for Best Sound Effects Editing. Its other losing nominations were for Best Original Screenplay and Best Sound. The fantasy film also helped to encourage an onslaught of time-travel related films in the 80s and 90s. It was the highest-grossing film of 1985 (at $210 million domestically), and its worldwide box-office was $381 million. Originally, there was no plan for a film sequel.